Hook is usually equipped with a safety latch to prevent the disengagement of the lifting wire rope sling, chain or rope to which the load is attached. Hooks can be classified into single hook and double hooks according to the appearance; forged hooks and strapped hooks according to production method. 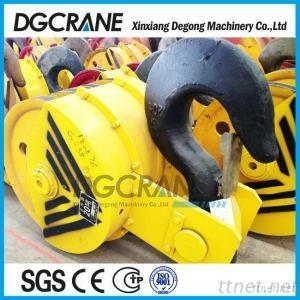 Hook is connected to the crane and the weight of the link, plays a vital role, and must attach importance to the maintenance of it. So if the hook hoisting height limiter or hook locking device failure or damage, the hook absolutely cannot be used.